How do I find out what commercial businesses are coming to Apex? Click on the link to Future Developments. To see detailed site plans for developments, click on the town's Interactive Map on Future Developments. Can the Chamber provide me with more demographic information? Yes, we can provide detailed demographics that can begin at a specific point and cover a one, three and five mile radius. We can tailor them to specific individual needs. 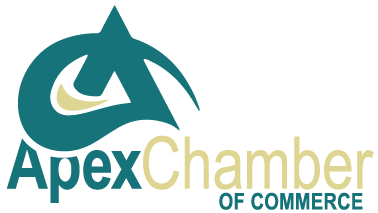 What if I have more questions about the Apex Chamber of Commerce? Give us a call or send us an email, we would love to hear from you! * Contact the Chamber today to inquire about sponsorship opportunities and benefits.